The GoodReads giveaway of one autographed print copy of Never Too Late continues--it ends on August 16! US only! Don't miss your chance! SALE! Never Too Late for Nook is now on sale at Barnes and Noble for $1.99! Yes, it's true. In its pre-published infancy, Never Too Late had a prologue. Conventional wisdom in modern publishing tends to warn writers away from prologues. Prologues can certainly be done well and be vital to a story, but they can also be a false start of sorts that don't serve the story well. The Writer magazine has a great article on the pros and cons of prologues. I held on to NTL's prologue right up to the moment I began querying. Some agents wanted query packages to include the first five pages of the manuscript. If there's a prologue, it should included in those first five sample pages. When I considered whether NTL's prologue would really grab agents (and, by extension, readers), I knew in my heart that it wasn't essential to the story. In fact, the insights the prologue reveals about Lord Alexander Devin, the hero of NTL, are already embedded later in the novel, when it makes sense for the heroine to learn about them. More importantly, I realized that starting the novel with this prologue would have made it the hero's story rather than the heroine's. 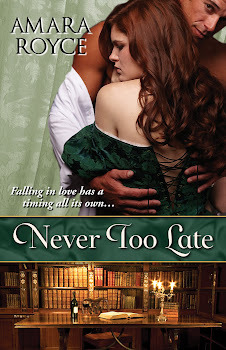 While NEVER TOO LATE is ultimately about the couple, it was important to me to give the heroine equal emphasis, "equal screen time," from the very beginning. So instead, the story starts with a glimpse of Mrs. Honoria Duchamp in her "natural habitat" when she (and readers) first encounter the mysterious Lord Devin. I think the story works better without the prologue...but you can decide for yourself! When the letter informing Viscount Anthony Devin’s family of his untimely death arrived, his wife crumpled against their eldest son. Alexander Nathaniel Montgomery Archer Devin, stoic and stalwart, kept his mother from slumping to the floor and braced himself against her tears, her wails, her curses, and eventually her fists. Recognizing the tremendous responsibility that now fell on his shoulders, he quietly tried to hold her and his siblings together. If at any time during the customary year-long mourning period, his eyes burned or his spirit weakened to grief, he did not show it publicly. Instead, he was the anchor holding his family steady in a tumultuous sea of grief. Even at 18, Alex bore his family responsibilities with aplomb and almost eerie maturity. It was Alex who made sure his secretary responded to every condolence the family received, when his mother could not get out of bed, could not speak to anyone other than her children, could not face daylight. It was Alex who made sure young Andrew promptly went back to Eton, using the convincing argument that it was what father would have wanted. It was Alex who made sure Amelia’s lessons continued to prepare her for coming out on schedule two years after their father’s passing. It was Alex who, a week after the tragic letter arrived, accepted and identified his father’s body, along with his last worldly possessions. That very evening, he’d left the monogrammed handkerchief and leather-bound notebook on his mother’s bedside table, unsure whether they would raise her heart or sink her deeper into grief but certain that she would want them for herself. He put his father’s watch aside for Andrew and some postcards his father wrote but never mailed aside for Amelia. But the maps, some clearly drawn by his father’s hand, and the compass and the canteen, he’d wanted to throw into the fire. He wanted to see them destroyed, as much as they’d destroyed his family. It was a near thing…the flames licking up toward the parchment as he prepared to feed the maps into the library fireplace. But at the last moment, he found he couldn’t. Having already taken on many estate duties during his father’s frequent travels, so-called “exploratory missions,” Alex now took on his father’s title and, to his chagrin, his father’s legacy. Well-meaning associates and acquaintances praised his father’s fearless sense of adventure and keen observation skills. “One of England's finest,” they said. “A model of British intrepidity,” they said. Despite himself, he could recall the many times in his youth that he’d stay up well past his bedtime night after night because a letter promised his father’s return. The many times he’d loiter along the lane anticipating a glimpse of his father’s horse. The many times he’d run at the man, larger than life, to grab at him fiercely, be hoisted up on his shoulders, and ride home triumphantly. He could also recall, just as many times, the crushing disappointment when later that week or even later that homecoming day he found out that his father was already planning another jaunt and that, yet again, he was too young to be part of it. He could recall the joy in his mother’s eyes every time she welcomed Lord Devin home and the beseeching sadness she strove to hide whenever he took leave again. His siblings inherited their father’s wanderlust. They’d sat rapt as his father told stories of exotic lands and peoples. They’d played pirates and taken to wandering the wooded grounds when they were old enough. As in love as they were with their father, both Amelia and Andrew loved the world he brought to them and showed every sign that they would seek it for themselves as soon as they were able. But he, now Viscount Devin, knew the dangers of such selfish and reckless desires. Everyone else celebrated his father’s wanderlust, as if it were something to emulate. Diving off Japanese cliffs. Tracing South American rivers. Spelunking in Indian caves. As if falling to your death, a misstep while copying supposedly ancient cave drawings, was somehow noble and advantageous. Leaving a distraught wife and three impressionable children behind. Well, two impressionable children…he himself was hardly a child. Nor was he impressed by his father’s bravado. And he’d known, for several years and with absolute certainty, that such a letter would eventually come, that his father would perish in some awful way far from home and leave them shattered. From the moment he’d held the actual letter in his hands and read the words he’d predicted, he also knew one more thing without a doubt. He would never be his father. He would never indulge his own petty and self-centered desires at the expense of his family. He would never abandon them luxuriate in worldly excursions. He would never sacrifice them for some silly fantastical quest. He wouldn’t risk his life trivially. He would remain the bedrock upon which his mother and siblings could rebuild their lives. He would be steadfast, tenable…present. His loved ones would never have to question his loyalty or his reliability…or his whereabouts. He would never allow his attention to be diverted from his family, and he would do anything…anything…to protect them.